Nathan 5K Runner's Pack - To Buy or Not in Apr 2019? 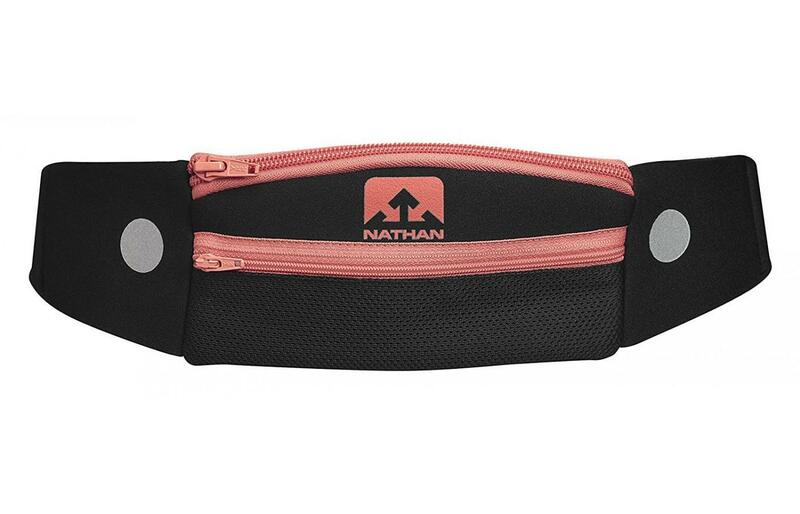 The Nathan 5K Runner’s Pack is a fitness belt designed to be worn during long and short distance runs. It features an adjustable belt that can be worn by people with any size waist between 18 and 55 inches and stays in place even during long runs. Its two zippered pouches can fit up to 20.5 cubic inches or 0.34 liters, which is great for storing small items such as mp3 players, money, keys, ID cards, energy packs and more. The larger of the two pouches can safely carry most smartphones, and the runner’s pack fits snugly around both the items and the wearer’s waist, so it does not bounce during runs. Available in eight different colors, the outside of the runner’s pack has 3M Scotchlite reflective material that keeps the wearer safe and visible in low-light conditions such as early morning and evening runs. Weighing just 1.9 oz (53.9 g) and made in the USA, this lightweight pack is great for just about any occasion. If you are looking for something convenient in which to store your items while running, read on to find out about the Nathan 5K Runner’s pack is the right choice for you. The 5K Runner's Pack's main use is storage. Many testers noted that they used the pack for storing their car keys and smartphones while going on their daily runs. It has two zippered pouches: a smaller pouch in the front that can fit items such as keys and energy packs and a larger pouch behind it that is perfect for storing credit cards, phones, and mp3 players. The total capacity is 20.5 cubic inches or 0.34 liters: large enough to carry essential items, but not so large that it weighs down the wearer. It can be worn on long and short distance runs or anything in between, not just the 5K. It can be used for daily runs or special events. This runner's pack can also be worn for non-running fitness activities such as biking, rock climbing or working out at the gym. It is also worn for safety: it has 3M Scotchlite material that reflects light to keep the wearer visible even when it is dark or foggy outside. Some runners also wear bright clothing or lights for even more visibility at night. The Nathan 5K Runner's Pack has good breathability under most conditions. It is made of neoprene, a synthetic rubber that is known for its flexibility and chemical stability under a range of temperatures. The fabric is woven together to allow air to travel in and out of the pouch and strap in order to prevent overheating. Additionally, it hugs the body in order to prevent both bouncing and irritation. It is sweat resistant, which is great for warmer days, but not waterproof, so it is not ideal for swimming or going through water. Most reviewers did not experience problems in this area, but some found that their smartphones overheated under extremely high temperatures. To improve breathability, this product could have used a natural instead of synthetic material, although this might have compromised flexibility. Testers rated this belt as very comfortable. It weighs just 1.9 oz (53.9 g), so it does not feel heavy at all and can comfortably be worn on short runs or long distance hikes. Its relatively small capacity, just holding a few necessary items, also keeps the weight low for a more comfortable running experience. The neoprene material has good flexibility, so it hugs just above the wearer's waist and does not rub or slide up and down while the wearer is running. The zippers and pouches are easy to use and reach. Slide the pouch in front of you to put things in or take them out, and then slide it over to your back before running. This pack fits most sizes, although some people with smaller waists experienced some sliding or bouncing during their runs, which caused some discomfort. And even though it is lightweight, a few testers thought it felt too bulky, with the straps both wider and thicker than the elastic straps used on other Nathan's products. The Nathan 5K Runner's Pack is one size fits most. Its adjustable belt can fit waists between 18 and 55 inches in diameter. Most testers did not have issues with the sizing, although some of the smaller people thought that the strap was too large (the smallest size would comfortably fit a 32-inch waist). Testers with 53-inch waists were at the end of the strap's line, so the belt would not fit on larger people. The belt easily adjusts from the side for a fit that is tight enough to stay comfortable and avoid bouncing, but loose enough to freely move around in. 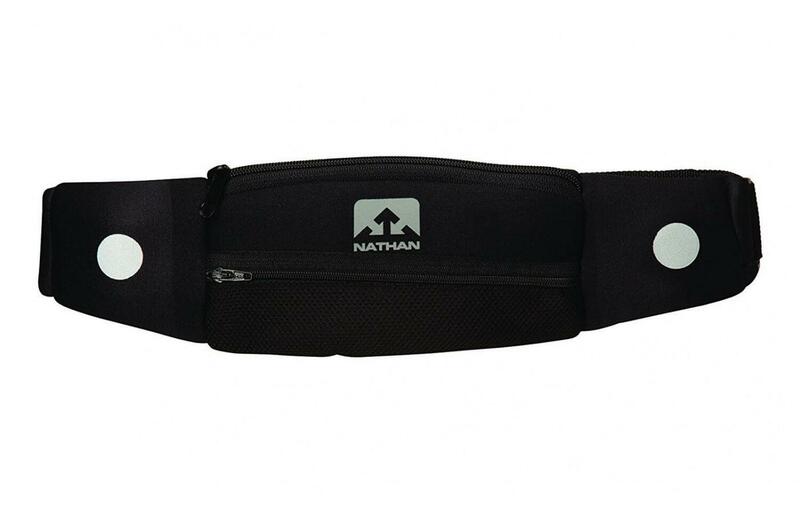 The strap is about four inches wide, which is thicker than previous Nathan's packs. The pack itself can fit up to 20.5 cubic inches or 0.34 liters, which is good for most smartphones, although testers noted that large smartphones and cameras might not fit. The biggest complaints about the 5K Runner's Pack were in the area of durability. Some testers had their pack start to tear at the straps after just two runs. Others experienced split seams or frayed ends after about a month of use. Another issue was the zipper either jamming or coming off entirely. That said, most testers gave the 5K Runner's Pack a favorable review and did not have problems with durability. Many were able to use this pack for several months without any sign of wear and tear, and some even purchased multiple packs because they liked it so much. The neoprene material is flexible enough to hug and move with the wearer and any stored items, and chemically stable under both hot and cold temperatures, so it will not rip or melt if it gets too hot outside. Some testers noted that their smartphones would overheat when the weather was extremely hot, but that could happen in hot weather even without a runner's pack. This runner's pack is very versatile and can be used with many accessories. The most popular accessories seem to be smartphones, cards, and keys, as the pack easily stores them while running, so the wearer does not have to worry about dropping or losing these important items. Some people also store energy packs, vitamins or pills for allergies or headaches in the pack. It can also be used with earbuds for listening to music, wristbands for moisture wicking, LED safety lights for additional nighttime visibility, or smart watches that monitor the wearer's heart rate and help track calories burned. Water bottles also go well with this runner's pack, as hydration is very important during exercise, although it does not have a separate pouch for holding water bottles. Compression socks can help wick moisture, reduce swelling, and improve circulation and blood flow while running. This pouch also goes well with shirts and shorts of different colors. Other possible accessories include bike helmets, small cameras, trekking poles, backpacks, speakers, chargers, and camping gear, depending on the activity. 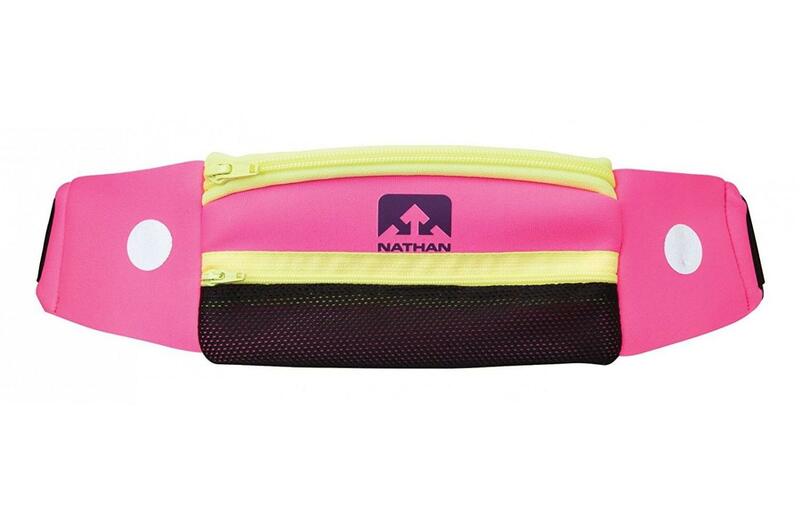 The Nathan 5K Runner's Pack has two pouches and comes in eight color choices. All of the style options have two reflective silver dots for visibility and safety, one on either side of the strap next to the two main pouches. The Black pack is solid black and looks good with any outfit. Andean Toucan, named after the Andes mountains in South America, is a fun light green color with gray zippers and black lower front pack. Black/Cockatoo, named after the bird, is mostly black but has light blue zippers. Black/Coral is also mostly black but has pinkish zippers similar to the color of the marine animal. 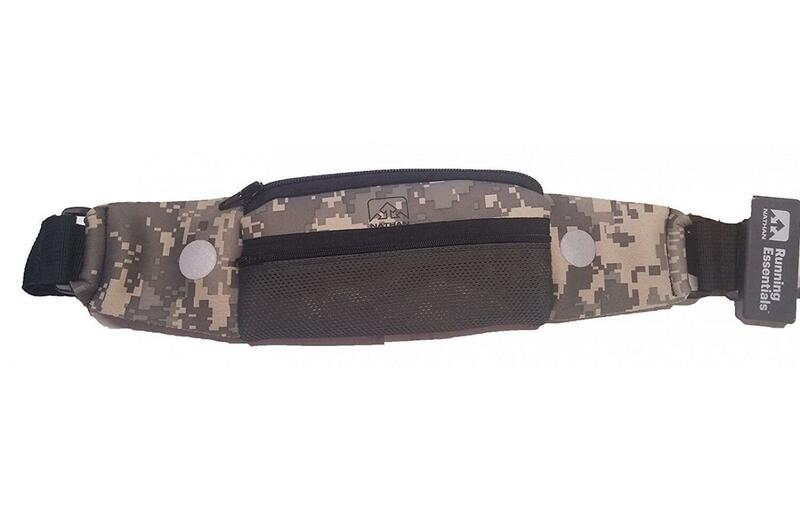 Camo is a camouflage-patterned pack with shades of tan and brown on the top pouch and straps, but the bottom pouch and zippers are black. Floro Fuchsia is the brightest of the color choices, with the straps and top pouch being pink, yellow zippers, and a black bottom pouch. 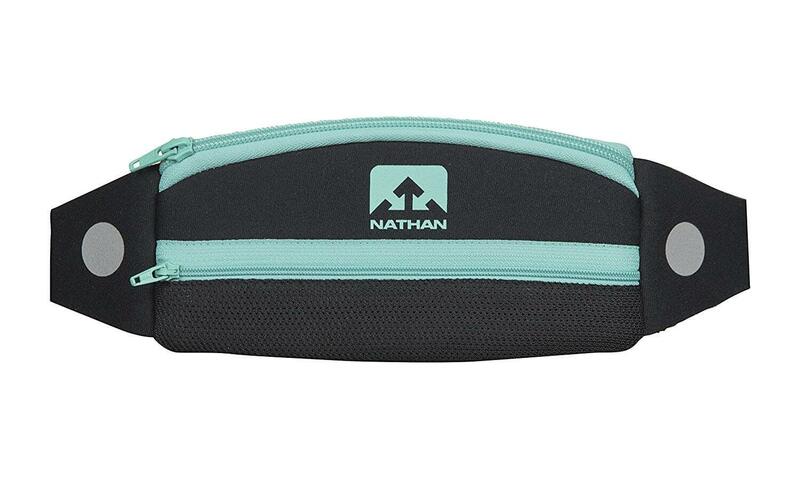 Nathan blue has bright blue on the straps and top pouch, yellow/green zippers, and a black bottom pouch. Very Berry features pink straps, a pink top pouch, dark pink zippers, and a black bottom pouch. All of the color options were popular with testers, with many of them stating they had purchased the pack in multiple colors to wear with different running outfits. This runner's pack is reasonably priced, but it is on the pricey side for its category. Some runner's packs are around half of the price of this one, while others are in the same price range. Within the Nathan 5K Runner's Pack style options, some colors cost a few dollars more than others, and the blue pack is double the price of the others, likely because it is the most popular color. Many reviewers purchased more than one pack in different colors and were not deterred by the price, stating that they loved the pack and wanted to match with different outfits. Other testers had durability issues and preferred other brands with lower prices, complaining that the Nathan 5K Runner's pack costs more and yet falls apart more easily than other packs. This pack has great size, and weight that makes it easy and convenient to carry around on runs is adjustable to fit a wide range of people and fits most smartphones. Overall, it is an affordable pack that fits within most budgets, although there are less expensive options out there with similar functionality. Overall, the Nathan 5K Runner's Pack is a good option for carrying around small items while exercising. It can be used for keys, smartphones, cards, mp3 players, small cameras, pills, energy packs and more. It has a large enough capacity to fit the essentials but is not so big that it weighs the wearer down, which is especially important on longer runs where too much weight would cause one to get tired well before the finish line. It fits the items nicely so they do not bounce around. It can be worn for daily runs, running events, biking, rock or mountain climbing, or working out at the gym. It can also be worn for long and short distance runs, not just the 5K. It has 3M Scotchlite reflective material so the wearer can safely go running in the morning, at night, or in foggy weather. It is breathable and moisture resistant, although it is not waterproof, so swimming or running through rivers and waterfalls is not recommended. The belt is flexible and fits snugly around most waists: it is advertised as 18 to 55 inches but fits most comfortably on 32 to 53-inch waists. It is snug enough to not slide or bounce and loose enough to allow free movement during exercise. A significant number of testers had problems with durability on the straps, zippers or seams, although not enough to give the product a low average rating. It comes in eight color choices, so there is a color that matches just about any outfit and can be used with many different accessories. The price is a bit above average, although a lot of people still bought and liked it, and several even purchased more than one pack in different colors. Overall, the Nathan 5K Runner's Pack is a great fitness accessory for a wide range of uses, although there are more affordable and more durable options out there.